Erik Beranek’s translation of Jacques Rancière’s Béla Tarr, The Time After could not have been published at a better time. What a great feat to accomplish – to decode the thoughts of a Marxist philosopher on the complex oeuvre of a Hungarian auteur. A philosophical text has several meanings when written in its natural language yet even more upon translation. Hence, with each page turn, it became more and more obvious that Beranek has studied intricately each of Rancière’s words and indicated where multiple meanings are manifested. The book mimics an essay in brevity and physical size. Its ideas, however, are not small. I found myself having to take a break after every chapter and picture what I had just read – a trait akin to a Tarr character. In the same way that János Valuska daydreams and becomes mesmerised with György Eszter’s philosophical discoveries in Werckmeister Harmonies (2000), I experienced a comparable awe with Rancière’s text, particularly the sections in which the philosopher delves into anthropomorphic objectives and ideals pertaining to the cosmos “…where human speech and gestures tend toward those of animals” (9). 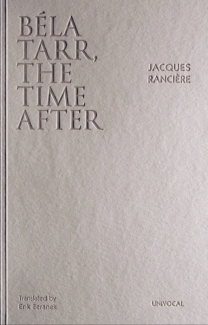 As for the structure of the book, Rancière begins with Tarr’s earlier period, his more ‘realist’ films, appropriately mentioning Sartre – a reference that shifts to Flaubert and Proust on the subject of Tarr’s second period, or what has been described as metaphysical portrayals more closely associated with the art cinema aesthetic. Furthermore, Rancière divides his chapters per Tarr film but refrains from naming them accordingly, instead inventing visually suggestive titles such as ‘Empire of the Rain’ for Damnation (1988) where “the incessant rain destroys all” (28) and ‘Crooks, Idiots and Madmen’ associated with the 7-hour epic Sátántangó (1994). Although Rancière selects a particular film as a backbone for each chapter, he also allocates room for Tarr’s other features to orbit around the main topic of examination. Rancière’s imagination is, without a doubt, poetic and often surprising. At one point the discussion commences with the space that Marion Crane inhabits at the beginning of Hitchcock’s Psycho when she meets her lover in a hotel room. It then morphs into a scene comparison with the opening of Damnation, where Rancière argues against the existence of an establishing shot in Tarr’s films. There is also a considerable amount of attention paid towards the otherworldly characters and motifs in Tarr’s films. If a moving picture could be adapted eloquently into a written text, then Rancière’s prose is exactly this. The character descriptions are as multifaceted as the way Tarr presents them to us on the screen – revealing everything and at the same time nothing. These personas are likened to supernatural entities from witches to devils and placed within a hierarchal realm where the human characters with their evil, scheming and deceitful attributes are superior to the cats that they poison and the dogs that they challenge. But the weather is a greater force than all of the living because “… the devil is ultimately nothing but the fog, the wind, the rain, and the mud that penetrates walls and clothes, in order to install themselves in hearts” (29). The chapter on Sátántangó is rich in intertextuality with comparisons between Pinocchio and the whale; in the chapter on Werckmeister Harmonies, biblical allusions such as the myth of Lazarus and limbo, the binary contests between light and dark/good and evil, and Nietzsche’s herd mentality are all referenced. There is a certain concentration on the presence of animals in Sátántangó with attentive descriptions of an anthropomorphic leaning – “human spiders” (39), “men-spiders” (44), “the body of the monster” (53) -are all metaphors that creep their way into the text. Complimenting these ideals is the reappearance of the sense of otherworldliness as seen in the previous chapter where “faces without bodies” (47) run parallel with “the cries of animals” (48) bringing together the mystery of the fine line that separates humans from animals while establishing a sense of absurdity comparable to Beckett’s Waiting for Godot – “We await he who will never come, but in whose place all sorts of false messiahs will come” (63). In the final stages of the book there is a return to the organic where the Great Hungarian Plain becomes the protagonist embodying the animals and the humans within its deepest, most desolate corners “where the world slowly comes to be fixed in a gaze, to be etched on a face, to weigh down upon a body’s posture, to fashion its gestures, and to produce that part of the body called soul” (64). And all of these entities move round in a perpetual circle, rotating eternally and haunting our perspectives with the menacing thought that they are the unknown, the unexplained, the otherworldly. Olivia Maria Hărşan is a Masters candidate in Cinema Studies at La Trobe University. Her thesis questions notions of existence in the films of Béla Tarr, exploring the question of “what is it to exist?” through various theories across psychology, philosophy and art history. Research interests include totalitarian iconographies in Romanian Cinema pre 1989, New Romanian Cinema and other Eastern European cinemas with particular emphasis on the Theatre of the Absurd and the socio-political farce.